Religion & Spirituality Author Focuses on Faith and Spirituality as Unifying Experiences in a New Book: "Original Faith"
PHILADELPHIA, PA--(Marketwire - July 9, 2008) - The interfaith movement recognizes the need for religion to serve as a force for unity, but greater inclusiveness often leads to generalities that fail to inspire. 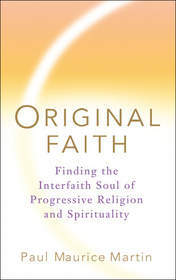 Paul Maurice Martin's "Original Faith: Finding the Interfaith Soul of Progressive Religion and Spirituality" enriches faith for believers, opens the door to faith for non-believers and spells out the essentials of spirituality for all those seeking a way forward. "Original Faith" is a book from the religion and spirituality bookshelf that transcends its category. It establishes that each of us is here to help keep the faith, including those who self-identify as not believing in any form of religion or spirituality. "Original Faith" sets doctrine aside to see what's left of religion and spirituality when viewed from the perspective of shared human experience. What's left? A lot. Take, for example, Chapter One, which is simply and accurately titled "What Love Is." Martin describes this cornerstone of spirituality and religion, not with familiar clichés, but in freshly evocative language that first stirs readers into feeling love and then conceptualizes it with indelible precision. "Original Faith" does the same for other key concepts in spirituality and religion, including faith, work and our development of an identity beyond ego. After inspiring and informing us, the book goes on to provide numerous practical suggestions to help transform our lives so that we can help give positive direction to the larger world in our own ways. This is the real business of "Original Faith": it calls for recognition that the real business of our lives is to help create a viable future for coming generations. For Martin, survival is the immediate and compelling purpose of religion and spirituality. Paul Maurice Martin, in his fifteenth year of a progressive illness that has left him mostly bedridden, holds an M.A. in Religion from the University of Chicago and an M.Ed. in Counseling from the University of New Hampshire. "Original Faith" is currently available on Amazon.com and Target.com. For more information including a web-based media kit, please see www.originalfaith.com. Martin's Original Faith blog at www.originalfaith.com/blog welcomes commentators from every religious tradition as well as atheists and agnostics.